Realtime Gaming has just released another brilliant new hi rez, full screen online slots game called Secret Symbol. The Aztec Empire once brought peace and prosperity to most of Central America. 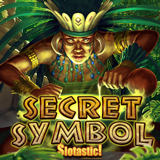 Now available at Slotastic, the new Aztec-themed Secret Symbol slot game from Realtime Gaming is paying winners all over the world. Until the end of the month, Slotastic will give you 50 free spins on the new game and they’ll double your deposits to give more play time on the new game. Jungle animals and Aztec artifacts including jewelry and other cultural artifacts spin on Secret Symbol’s five reels. When the Wild, an Aztec Chief , appears on the second or fourth reel it expands to cover the entire reel and creating possibilities for more winning combinations. A free spins feature is triggered by three Pyramid scatter symbols. All wins during free spins are multiplied from 2X to 20X. 50 free spins available until March 31, 2017. Until the end of the month, you can take 50 free spins on the new game. Deposits (up to $444) will be doubled. (Coupon Code: SYMBOL50). One deposit earlier in March is required to claim this free bonus. The coupon code for the second bonus is SECRETSYMBOL. Both bonuses are available until March 31 only. Secret Symbol is available in Slotastic’s mobile casino which has just had an interface upgrade. Controls have been simplified and new swipe and tap gestures make for smoother game play. Many games are now displayed in either landscape or portrait mode so they look great no matter which way phones and tablets are held.